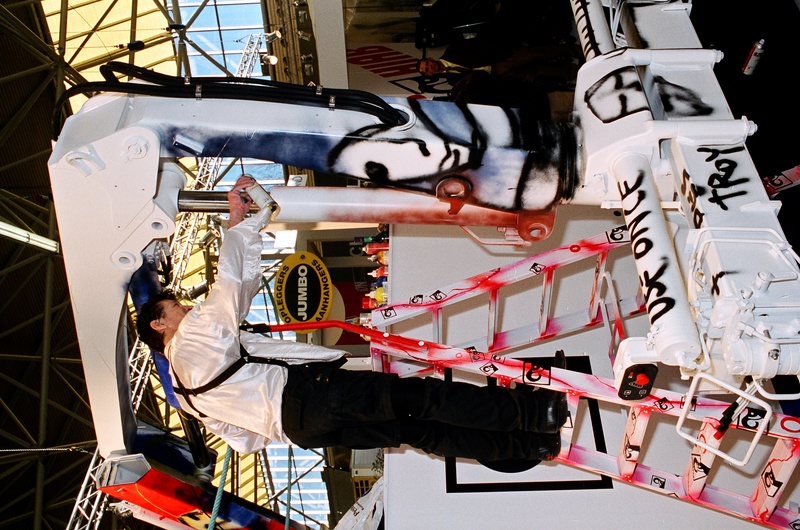 In 2000, Cargotec invited the famous Dutch artist, Herman Brood, to paint a Hiab loader crane at the RAI exhibition. At this year's RAI exhibition, to be held on 17-21 April, the same crane - a Hiab 102 - will be auctioned to support an independent humanitarian organisation, War Child. "It is very satisfying that the beautiful pop-art crane is now put back into the spotlight where it belongs. It can provide even more benefits now, a little over ten years after it was painted by Herman Brood. For Cargotec, social responsibility is an important issue and an auction in support of the organisation, War Child, is something very positive," says Paulo Cardoso, Marketing Manager Cargotec Netherlands. The multi-talented musician, artist and painter Herman Brood died in 2001 at the age of 54. He was a well-known and popular cultural personality in the Netherlands and abroad. Brood's art is expressive and modern with clear influences of the pop art of the 1950s and 1960s, where traditional painting was merged with modern mass culture like comic books, films and advertising. War Child Holland empowers children and young people to change their own future by protecting them from the effects of war, offering psychosocial support and stimulating education. The auction will take place at 17.00 on Friday the 20th of April at our stand 07.120 at the RAI exhibition.